The best selection of contemporary goods for women from today’s top independent designers. 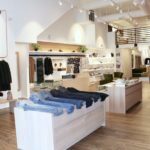 Founded in 2008 in Durham, NC, Vert & Vogue offers mindfully-made designs and personal styling, with care and joie de vivre. We curate hard-to-find clothes, shoes, accessories, and home goods. At the heart of our collection is quality, design, natural fiber textiles, and manufacturing in the US and Europe. Vert & Vogue has been featured in The New York Times and recognized as a top women’s store in the country. In December 2017, we became a certified B Corp. We’re proud to be a part of the revitalization of Downtown Durham.